John Angle has been promoted to vice president and project executive for W.M. Jordan Company, a Virginia and North Carolina construction and general contractor company. Angle is based in the company’s Newport News headquarters and is a construction professional with 25 years of experience. Leslie Baker has been hired as the media relations specialist for the Hampton Convention & Visitor Bureau. She will be responsible for developing content on the official websites for the CVB and its affiliates and will also lead social media efforts. Bob Boyd recently joined Colonna’s Shipyard as vice president of strategic growth & development, focusing on pursuing the growth of Colonna’s Shipyard as well as continued efforts to expand the company’s diverse but complimentary lines of business. 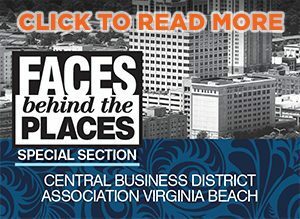 Previously, Boyd held a 36-year career in banking, most recently as Hampton Roads Regional President for BB&T. Chrissy Brown has been promoted from operations manager to executive vice president of operations for Atlantic Bay Mortgage Group. In her new role, she will be responsible for overseeing the closing department, underwriting, processing, title review and homeowners’ insurance review for Atlantic Bay’s operations team. Clymer Cease has been named chairman of the board for Clark Nexsen. In this role, he will provide strategic guidance and leadership to the firm and the board of directors. Cease will lead the expansion of the firm’s business development and support the president’s implementation of operation. Tyler Craddock has joined Organization Management Group Inc. (OMG) as vice president of government affairs, bringing 17 years of local- and state-level legislative and lobbying experience in issues impacting regulation and governance of business and trade associations. Mary Cullen has been appointed vice president of nuclear propulsion for Newport News Shipbuilding. In her new position, Cullen will be responsible for overhaul engineering, reactor services, test engineering, radiological controls, construction and process engineering, as well as refueling production and nuclear support. Ryan Downey has been promoted to director of media & community relations for the Hampton Convention & Visitor Bureau. Downey’s new duties will include leading a three-person media relations team; acting as a liaison between the Hampton CVB and advertising agency of record, providing direction on creative design and media placements; and managing campaigns and marketing materials. Terri Hall has been named president of Clark Nexsen. In this position, she is responsible for operations across the firm and providing executive leadership and strategic guidance. Howard H. Hoege III is the new president and CEO of The Mariners’ Museum and Park. Hoege has been acting as the interim president and CEO since May 1 and has helped lead the museum’s strategic planning process as a consultant in 2015. Read more about Hoege in this issue’s Success story on page 27. Wayne Jones, chief financial officer of St. Mary’s Home in Norfolk, has been selected by the board of directors to become CEO of the nonprofit residence serving children and adults who have severe disabilities. Jones has been CFO of St. Mary’s since June 2005 and has devoted his career to healthcare finance and administration, including more than 20 years at Bon Secours Maryview Medical Center in Portsmouth. Rebecca Kleinhample has been named interim executive director of the Virginia Living Museum by the museum’s board of trustees. Kleinhample, who has been the museum’s development director since July 2014, assumes the interim role on Dec. 1 following the departure of Executive Director Page Hayhurst. Hayhurst has accepted the position of President and CEO of Brookgreen Gardens in Murrells Inlet, South Carolina. Ronald J. Lauster has been promoted to vice president and project executive for W.M. Jordan Company, a Virginia and North Carolina construction and general contractor company. Lauster is based in the company’s Newport News headquarters and brings 24 years of management experience. Kate Pittman is the new executive director for Virginia Beach’s ViBe Creative District. Pittman is the first employee for the newly-minted nonprofit, which gained its IRS certification for tax-exempt status in June 2015. The selection was made after several months of consideration and interviews with the ViBe Creative District co-founders and the Friends of the Creative District Board of Directors. Amy E. (Mallett) Rickard was the recipient of Virginia Wesleyan College’s Alumni Service Award. A 1998 graduate of VWC, Rickard is currently the Manager of Client Services for Southern Company Gas, a subsidiary of Southern Company, one of the nation’s largest energy companies. She has been a member of the VWC Alumni Council since 2010, serving her most recent term as president. A Virginia Beach resident, Rickard is passionate about making a difference in her local community and giving back to her school community. Elizabeth Severs has been hired as media relations manager for the Hampton Convention & Visitor Bureau. Her responsibilities at the CVB will include developing press releases and designing content for marketing pieces. Chris Stone has been named chief executive officer for Clark Nexsen. He is responsible for publicly representing the organization and exploring growth opportunities and strategic alliances. Formerly serving as president since 2000, his leadership is distinguished by the belief that the architecture and engineering industry can make a transformative difference in the world. Diana Taylor has been promoted to vice president of human resources at Atlantic Bay Mortgage Group. Taylor has been with Atlantic Bay for over three years and has more than 15 years of human resources experience go to website. In her new role, Taylor will oversee the human resources department with respect to benefits and compliance, in addition to reviewing and updating all policies and procedures. Jamie Vanlandingham has been promoted from regional vice president of loan production to president of credit and risk for Atlantic Bay Mortgage Group. In her new role, she will be responsible for all guidance exceptions, construction lending, jumbo and other specialized projects for Atlantic Bay. Tom Winborne has been named chairman emeritus for Clark Nexsen. With a tenure of more than 40 years at Clark Nexsen, Winborne has been integral in the firm’s growth from 35 architects and engineers to more than 400 and in establishing key areas of market leadership. Rodney D. Young, Jr. was a recipient of Virginia Wesleyan College’s Graduate of the Last Decade (GOLD) Award. Upon graduating in 2007, Young worked patrol in the first precinct of the Norfolk Police Department until 2011, when he was assigned to the public housing unit. During his tenure in the public housing unit, he implemented a sports mentorship program to build positive rapport with the citizens of Norfolk and the Norfolk Police Department. In 2014, he was promoted to supervisor of the detective division. Today, he serves as a corporal for the Norfolk Police Department and continues to manage the sports mentorship program he launched with the public housing unit.